Unobtrusive, contactless recordings of physiological signals is very important for many health and human-computer interaction applications. Most current systems require sensors which intrusively touch the user’s skin. Recent advances in contact-free physiological signals open the door to many new types of applications. This technology promises to measure heart rate (HR) and respiration using video only. The effectiveness of this technology, its limitations, and ways of overcoming them deserves particular attention. 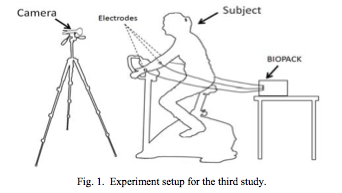 In this paper, we evaluate this technique for measuring HR in a controlled situation, in a naturalistic computer interaction session and in an exercise situation. For comparison, HR was measured simultaneously using an electrocardiography (ECG) device during all sessions. The results replicated the published results in controlled situations, but show that they cannot yet be considered as a valid measure of heart rate in naturalistic Human-Computer Interaction (HCI). We propose a machine learning approach to improve the accuracy of HR detection in naturalistic measurements. The results demonstrate that the root mean squared error is reduced from 43.76 beats per minute (bpm) to 3.64 (bpm) using the proposed method. This entry was posted in paper and tagged papers on November 25, 2013 by Rafael A. Calvo. Rafael A. Calvo, PhD is author, researcher, professor and director of the Wellbeing Technology Lab at the University of Sydney. Calvo is a Future Fellow of the Australian Research Council studying the design of wellbeing-supportive technology.